“Vasilopita” cake is the dessert – symbol of New Year and is connected with the feast of St. Basil, from which it took its name. We find it in many forms and different ways of preparing, in all Greek houses, urban and rural. Made mainly with flour, eggs, sugar and milk and most commonly on the surface is written the number of the New Year with peeled almonds. Inside the dough is placed a coin and whoever finds it is the lucky person of the year. In some rural areas instead of coin they used to place a piece of straw, vine or olive strand depending on the production area, and whoever found it would have a good harvest during the year. The cake is cut and shared with a ritual in the night before the New Year, right after the year change! There is, however, the Christian tradition for the custom of New Year cake. When St. Basil was bishop in Caesarea of Cappadocia, the perfector of Cappadocia wanted to plunder the city. St. Basil asked the city’s wealthy citizens to collect cutlery that could deliver as “ransom” to the conqueror. They gathered many valuables. However , according to the tradition the city was saved either because the perfector regretted, or because of a miracle with St. Mercurius and numerous angels removed his army from the province. But in order for St. Basil to return the valuables to the citizens, not knowing who owns what, he instructed to prepare small loaves into which he placed one of the coins or valuables and distributed them to the citizens the next day. The tradition continued in the memory of the day of his death, January 1st. Newer versions of this tradition from Pontus and Asia Minor show St. Basil winning the collector of taxes on gambling and then distributed them with small breads or a big pie. In Athens it is common to serve the so-called “Politiki” Vasilopita which is produced mainly from flour, eggs, sugar and milk, manufactured in various sizes and types, but is usually inflatable, fluffy and sweet. 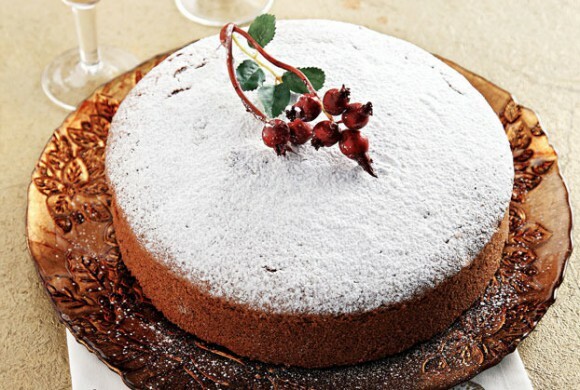 Other Vasilopita recipes are served throughout Greece, with spices , fruit etc. In western Macedonia instead of Vasilopita they serve a cheese or leek pie. Basic but common feature is that inside they have a coin, usually an ordinary one but in some cases gold (“Constantinato”) or silver. Then Vasilopita is cut on the table, in which the family is sitting. The landlord after the “crossing” of the pie with the knife three times, starts to cut into triangular pieces offered in each attending family member or friends and relatives. First piece is for the house (or the Christ, the Virgin Mary and Saint Basil), and the line continues with the landlord, landlady, family members and guests, with the last piece going for the poor, without of course forgetting any immigrants, patients and other family persons who for various reasons weren’t able to attend. Mix 100 g. flour with yeast, previously dissolved in warm water thereby making a dough and leave in warm place for 3 hours. Knead in remaining flour with whole eggs, butter dissolved, sugar, salt and leaven uploaded. We continue to work the dough for a while until it “thickens”. Add the chopped fruits, raisins and orange zest. Allow the dough to rise until doubled in volume . Place in mold and bake the pie at 180 Celsum degrees for about an hour. Leave at least for half a day, before serving.